- Directed by Sarah Gavron. Based on the novel by Monica Ali. 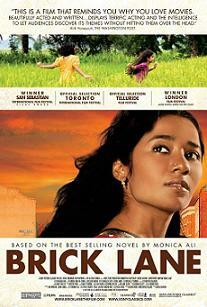 Nazneen (Tannishtha Chatterjee), a young woman from Bangladesh, settles down with her older, domineering husband, Chanu (Satish Kaushik), and two daughters (Naeema Begum and Lana Rahman) on Brick Lane in London’s East End. As her marriage deteriorates, she begins a love affair with Karim (Christopher Simpson), a political activist closer to her age, and writes letters to her sister, Hasina (Zafreen), who lives back in Bangladesh. Despite an initially compelling first act and few moving scenes, much of the drama feels contrived with a by-the-numbers plot and poorly developed characters. Decent performances by Thannishtha Chatterjee, Satish Kaushik and Christopher Simpson help to keep you at least mildly absorbed by the story. Unfortunately, co-screenwriters Laura Jones and Abi Morgan fail to bring any of the characters to life on the screen, though, while director Sarah Gibson shoots some scenes as if they were meant for a television soap opera. With a more sensitive, organic and character-driven script, Brick Land could have been as emotionally resonating and captivating as the far superior film, The Namesake. Number of times I checked my watch: 5. Released by Sony Pictures Classics. Opens at Landmark Sunshine Cinema and Lincoln Plaza Cinemas. - Directed by Cecilia Miniucchi. Claire (Samantha Morton), a meter maid, develops an unlikely romance with Jay (Jason Patric), a parking officer who physically and verbally abuses other people including his own son (Jonny Mack). Soon enough, Claire’s mother (Teri Garr) passes away and Claire becomes more dependent on Jay as a source of strength—although it doesn’t seem like there’s much comfort. How long will Claire be able to tolerate Jay’s aggressive behavior? What will it take to change him into a good, kind-hearted person? Writer/director Cecilia Miniucchi doesn’t provide easy answers to these compelling questions that the plot raises. She includes strong character development that allows Claire and Jay to seem complex and real. They both clearly suffer from loneliness and a mundane life, but there’s always much more to them than meets the eye. Although Jason behaves badly, it would be jumping the gun to label him as a “bad guy”; he just needs a lot of therapy. Moreover, Miniucchi wisely incorporates just the right amount of offbeat, dark humor to drama without going overboard in quirkiness. Along with strong performances, especially by Jason Patric, and a well-written screenplay, Expired manages to be refreshingly unpredictable, absorbing and oddly compelling. Number of times I checked my watch: 0. Released by MCR Releasing. Opens at the Angelika Film Center. - Directed by Peter Segal. 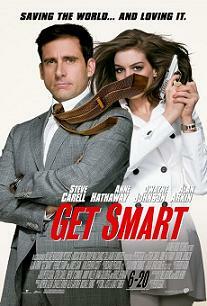 Maxwell Smart (Steve Carell), a.k.a. Agent 86, a secret spy for the agency CONTROL, teams up with Agent 99 (Anne Hathaway) and Agent 23 (Dwayne Johnson) to fight their nemesis, KAOS. Alan Arkin steals some scenes as the chief of CONTROL while Terrance Stamp does the same as the head of KAOS. Those who expect an amazing plot full of surprises should look elsewhere. The film aims for physical comedy and, occasionally, succeeds in generating some laughs, but for the most part, the comic timing feels off and the humor is too silly. Stupid humor could work with the smart script and competent directing/editing. However, director Peter Segal moves the camera so quickly that it’s hard to tell what you’re supposed to laugh at on screen, especially during the action sequences. Steve Carell, who surely proved his comedic talents in Bruce Almighty, does his best to make you laugh, but most of the time the result is merely a grin. He and Anne Hathaway lack the chemistry needed to keep the comedy afloat--Mike Myers and Elizabeth Hurley were a much better team in Austin Powers. At a running time of 110 minutes, Get Smart slightly overstays its welcome, but if you’re able to check your brain at the door and suspend your disbelief like you’ve done while watching most summer blockbusters, you’ll find the film at least mildly amusing and whacky without any cringe-worthy scenes. Number of times I checked my watch: 6. Released by Warner Bros. Pictures.